Interested in learning about the environmental humanities? You’ve come to the right place. UC Santa Barbara is a leader in the field. The Environmental Humanities Initiative (EHI) fosters and consolidates the diverse environmental humanities programing that takes place at UC Santa Barbara (UCSB). This website provides information about our innovative graduate and undergraduate degree programs, courses, faculty, research, campus events, and much more. Begin scrolling down for brief overviews of this programing and links to in-depth material. This EHI also provides an introduction to the environmental humanities. Not sure just what the environmental humanities are, or what they involve? This website supplies a range of resources that may be used in the classroom or by anyone interested in learning more. We have selected a number of books, films, and artworks, many of which can be sampled directly from this website, that are of special interest from the perspective of the environmental humanities. For more on these resources, scroll way down. Imagine an international academic conference attended by more than 50 speakers from a range of countries, who would have had to collectively fly over 300,00 miles – dumping the equivalent of 100,000 pounds of carbon dioxide into the upper atmosphere in the process – to get to the UCSB campus, yet with a nearly nonexistent carbon footprint. Sound impossible? Not only can it be done, it was done both for the May 2016 EHI conference on Climate Change: Views from the Humanities and our second EHI conference of the year: The World in 2050: Creating/Imagining Just Climate Futures, which featured speakers from six continents, including Bill McKibben, who the Boston Globe described as “probably the nation’s leading environmentalist.” Two additional conference were staged in 2017: Activists, Artists, and Academics: Building Just Climate Futures Together and the UC-CSU KAN Conference. Our most recent NCN conference was the June 14-30, 2018 ASLE-Sponsored Symposium A Clockwork Green: Ecomedia in the Anthropocene. Our 2019 NCN-conference, Next Earth: Teaching Climate Change Across the Disciplines, will be held from June 10-30. Be sure to check out the CFP and submit your abstract by March 15! Interested in staging a nearly carbon-neutral (NCN) conference? For the rationale behind this approach (which differs significantly from a typical webinar or teleconference) and details on how to coordinate such events, see the White Paper / Practical Guide written by EHI Director Ken Hiltner. UC Santa Barbara is home to more than 70 faculty members who teach courses that address issues in the environmental humanities. Over 90% of these are tenured or tenure-track professors. Our faculty also does groundbreaking research, having collectively published dozens of books and hundreds of articles in the environmental humanities. Books include After the Grizzly: Endangered Species and the Politics of Place in California, Balancing on a Planet: The Future of Food and Agriculture, Ecocriticism: The Essential Reader, Humans in the Landscape: An Introduction to Environmental Studies, Environmental Criticism for the 21st Century, The Rights of Nature: A History of Environmental Ethics, Catastrophe in the Making: The Engineering of Katrina and the Disasters of Tomorrow, Milton and Ecology, & Wilderness and the American Mind (more on EH faculty; more on faculty books; faculty interviews). With over 200 unique courses addressing issues in the environmental humanities, and still more on the way, UC Santa Barbara is deeply committed to EH education. Because quite a few of these courses are taught annually, in recent years thousands of students have enrolled in over 400 classes (video interviews with undergraduates; interviews with Ph.D. candidates). Undergraduates can take courses as diverse as Race & Environmental Justice, The Rhetoric of the Anthropocene & Climate Change, Introduction to Environmental Media, Global Cities & Transnational Urbanism, Environmental Ethics, Religion & Ecology in the Americas, Green Movements & Green Parties, and Writing About Sustainability – to name just a few (view all undergrad courses; featured courses). Graduate courses include Environmental Law and Policy; Utopia and the Environment; Science Studies and the Cultures of Environmentalism; Environmental Perception and Cognition; Environmental Institutions; Ecological Imperialism; Nature, and Conquest in Latin America; Population, Development, and the Environment; Nature and Value in Eighteenth Century British Culture; and Animal Theory (full grad course list). Although the scale of the problem demands that academia, the sciences, business, government, and the public quickly begin acting in concert to achieve the best possible outcomes, decades of inaction rooted in interest-driven conflict and disagreements have ushered in a new era of environmental and climate crises. The range of possible futures includes widely divergent “next Earths” and any number of paths forward. As educators in climate change, climate justice, critical sustainability, and carbon neutrality, our responsibility could not be greater to our students, for they are the generation that will forge the ideas that will determine which of these next Earths will be our home. To that end, we would like to bring together critical climate and sustainability educators of every discipline, from the arts and humanities to the human and social sciences and the natural sciences, with a focus on sharing ideas to accelerate climate education and action in California and beyond. Climate Futures is the 2015-2017 theme for both our Environmental Humanities Initiative and UCSB’s Critical Issues in America series. 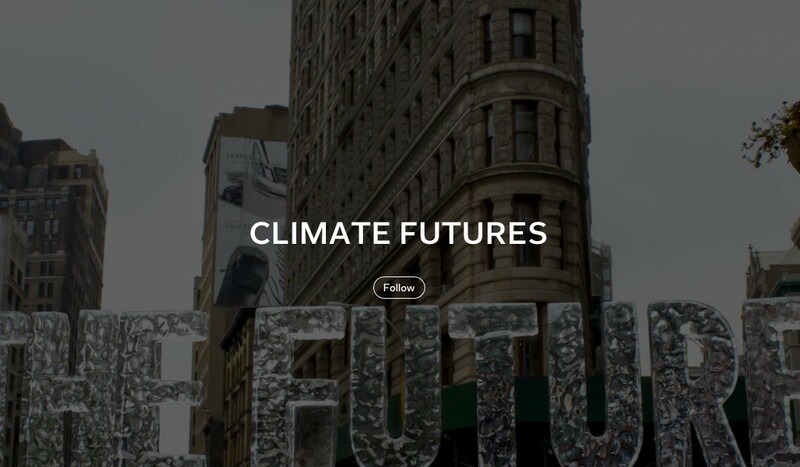 Although many climate futures are possible – and, as we are so often told, many of them are indeed pretty glum – we are imagining a future in which individuals, groups, and institutions across the globe have worked to help make it a better one – ecologically sustainable, more egalitarian, deeply democratic, and joyful (more, including videos & podcasts). The Anthropocene is the 2014-15 theme for both UCSB’s Environmental Humanities Initiative (EHI) and our Interdisciplinary Humanities Center (IHC). Videos of talks from the IHC’s public events series, The Anthropocene: Views from the Humanities, can be viewed directly from this website, along with introductory videos and talks given outside of UCSB on the the Anthropocene from the perspective of the humanities (more). UC Santa Barbara has 24 Departments, Programs, & Schools that offer courses addressing issues in the environmental humanities. These include Anthropology, Art, Black Studies, Bren School of Environmental Science & Management, Chican@ Studies, Classics, Creative Studies, East Asian Studies, Economics, English, Environmental Studies, Feminist Studies, Film & Media Studies, Germanic Studies, Geography, Global Studies, History, History of Art & Architecture, Interdisciplinary Studies, Political Science, Religious Studies, Sociology, Theater & Dance, and Writing Program (more). At UC Santa Barbara, the arts and humanities matter a great deal – and not just environmentally. Our Division of Humanities and Fine Arts includes areas that have been at the heart of a liberal arts education for centuries (history, literature, languages, philosophy, religion, culture, and the visual and performing arts) and innovative, interdisciplinary approaches that are remapping the university in the 21st century, such as film and media studies, environmental humanities, and socio-cultural linguistics (explore your interests). Interested in getting involved? UCSB has nearly 50 campus environmental groups, including the Associated Students Environmental Affairs Board (the largest environmental group on campus), the Sustainability Internship Program (which offers a wide array of opportunities for current undergraduate and graduate students to participate in campus and community based programs and initiatives), the Excursion Club (an outdoor adventure club offering hiking, kayaking, climbing, and a variety of other activities and trips), and many more (complete list with links). Among other issues, our faculty works on climate change, the emergence of environmental thinking, the cultural/environmental implications of urbanization, histories of land use, natural resource management, environmental politics, non-human/human relations, environmental and social justice within a global rather than national context, and the political impact of institutions, networks, and regimes on the biosphere (view faculty research interests). Learning and discovery rarely take place in a vacuum. UC Santa Barbara is home to a number of deeply collaborative projects that network students and faculty from across the arts, humanities, and sciences. For example, a recent project brought together faculty from Film and Media Studies; Ecology, Evolution, and Marine Biology; Sociology; History and Anthropology; English; and East Asian Languages and Cultural Studies in order to consider the issue of impending sea level rise (more). Each year, speakers from across the country (and globe) come to UC Santa Barbara to give talks on issues related to the Environmental Humanities. One of the goals of the EHI is, whenever possible, to film these events and archive them on this website, Vimeo, and, Youtube. In 2014-15, many of these talks are part of the IHC’s public events series, The Anthropocene: Views from the Humanities (view videos of talks). UC Santa Barbara’s institutional commitment to environmental studies dates from 1969. After one of the worst oil spills in U.S. history, which came from a drilling platform off the Santa Barbara coast, a group of twenty-one UC Santa Barbara faculty members calling themselves the “Friends of the Human Habitat” came together and soon established what has become one of the oldest, largest, and most respected environmental studies programs in the country (more). The Bren School of Environmental Science & Management at UC Santa Barbara is one of the most respected schools of its kind in the nation. Offering both master’s and doctorate degrees, it is among a handful of schools in the United States – and the only one in the West – that integrate science, management, law, economics, and policy as part of an interdisciplinary approach to environmental problem-solving (more). The Interdepartmental PhD Emphasis in Environment and Society (IEES) at UCSB provides doctoral students from a range of departments an opportunity to receive training and mentorship in interdisciplinary environmental studies beyond the scope of their normal degree programs. Students that join the emphasis and complete all of the requirements receive a certificate analogous to an undergraduate minor (more). UCSB’s Environmental Media Initiative (EMI), part of the Carsey-Wolf Center, brings together environmental scientists with film and media scholars—drawn from the humanities, arts, and social sciences—to collaborate on teaching, research, and public programming. The EMI explores all of the ways media and the environment influence, structure, and inhabit each other: the environment in media, media in the environment (more). UCSB’s Literature and the Environment Center is a national leader in the study of ecocriticism. What makes us unique is that, with a range of faculty members doing diverse though often interconnected research, we have seamless, strong coverage in ecocritical coursework from the early Renaissance through the 21st century. Moreover, we explore environmental issues from British, American, and Global perspectives (more). The Architecture & Environment emphasis allows students to explore how human beings have positioned themselves spatially in relation to the environment at various cultural and historical moments. UCSB has six architectural historians on its faculty, one of the largest concentrations in any university on the West Coast, with expertise from ancient to contemporary periods (more). UCSB’s Interdisciplinary Humanities Center (IHC) is deeply committed to environmental issues. The IHC has recently coordinated yearlong series on Food Matters (2008-09), Oil + Water (2009-10), Geographies of Place (2010-11), and The Anthropocene: Views from the Humanities (2014-15), which together contained over 100 unique talks and events (more). UCSB’s Blue Horizons summer program, a project of our Environmental Media Initiative, teaches students how to produce documentary films – from developing a film’s core idea and story, to thinking about its impact on its audiences, to the nuts-and-bolts of video production. After examining critical issues of our region’s oceans and seashores, students produce their own documentaries (more, including sample videos). UCSB’s GreenScreen is a hands-on, project-based environmental media production program where students work in teams to leverage their collective production skills and environmental knowledge. The program not only increases awareness about the environment, it expands on the ways that these issues are represented and communicated (more, including sample videos). UCSB’s Davidson Library is the editorial headquarters for The Writings of Henry David Thoreau, a National Endowment for the Humanities (NEH) project that is publishing definitive editions of the complete works of the writer and naturalist, including his works for publication, his Journal, his correspondence, and other uncollected papers. Much of the material has never been published before. To date, seventeen volumes of a projected twenty-eight have been published (more). UCSB is home to the National Center for Ecological Analysis and Synthesis (NCEAS), which is launching a new initiative — SNAP, or Science for Nature and People — in partnership with The Nature Conservancy and the Wildlife Conservation Society. Among other issues, SNAP takes up the question of how nature conservation can broadly benefit human well-being while also enhancing longer-term ecological resilience and sustainability (more). As a joint initiative, UCSB’s Carsey-Wolf Center and the Bren School of Environmental Science & Management offer a graduate program in Strategic Environmental Communication & Media. The program is a 12-unit “focus” in which students learn to use media to communicate effectively and strategically around environmental issues including developing more compelling environmental stories, targeting appropriate audiences, and monitoring and managing environmental messages (more). If you have not done so already, please visit and scroll down our Intro Page, which will direct you back to this page when finished. It only takes two or three minutes (including viewing the provided video), but provides a quick overview of the environmental humanities and the EHI. In a startling variety of ways, contemporary artists are exploring the relationship that our species has to its planet. We have aggregated some of this very intriguing work on this website. Our online gallery can be viewed in large portfolio view or with full descriptions in gallery view. The EHI aggregates a range of video resources, most of which may be played directly from this website, introducing issues that are of interest from the perspective of the environmental humanities. These may be used as classroom resources or by anyone interested in becoming acquainted with these timely and important concerns (more). 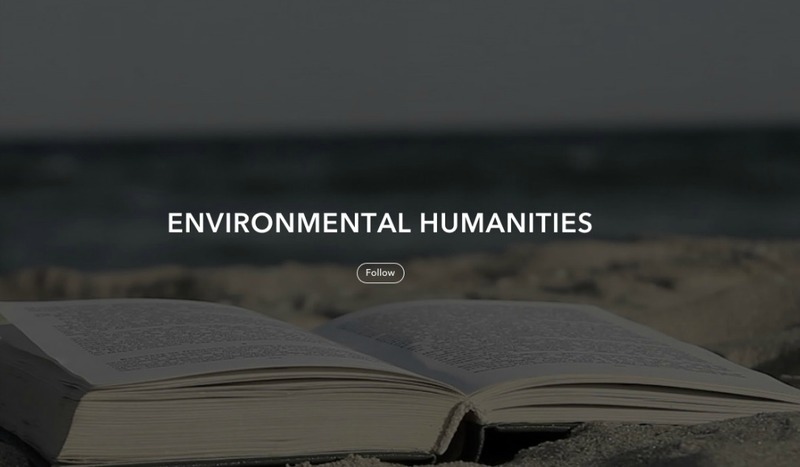 The Environmental Humanities Initiative maintains online bookshelves introducing a variety of books of interest from the perspective of the environmental humanities (more). This website was entirely crafted by UCSB students and the EHI Director, without any professional assistance. This not only includes the website, but content such as video interviews. 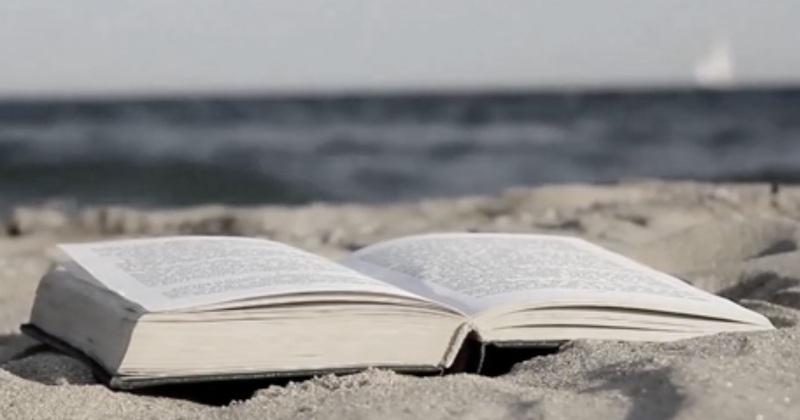 At UCSB we believe that the humanities have a major role to play in environmental communication. While working on his Ph.D. in English at UCSB, Zach Horton, who served for a year as the EHI Graduate Fellow, directed a number of film projects, including the documentary Whatever Happened to Solar Innovation? and Swerve, a feature film serialized into ten chapters that imagines life in a future post-apocalyptic California. Watch both films. Situated on a 1,000-acre promontory that overlooks the Pacific Ocean, the UC Santa Barbara campus is one of the most beautiful in the nation. If you have not done so already, click the image on the top of this page for a short but sweeping video tour of the campus (more). UCSB placed third in the nation in the Princeton Review’s 2015 top 50 green colleges – and #1 among U.S. public universities, underscoring our unwavering commitment to sustainability. U.S. News and World Report ranked us as one of the top 10 eco-friendly college campuses in the country and the Sierra Club named us as one of the top 10 greenest campuses in America. The University of California recently made the largest solar power purchase of any higher education institution in the nation – a major step toward our goal of achieving carbon neutrality (i.e. zero-net greenhouse gas emissions from all buildings and vehicles) by 2025. We have already reduced emissions to the same level as the year 2000 (more). With 10 miles of dedicated Class I bike paths and over 10,000 bicycle parking spaces, it is hardly surprising that half of UCSB students commute by bike. We have been called one of America’s most bike-friendly campuses and have been given a “gold” rating by the League of American Bicyclists. UCSB’s faculty includes six Nobel Laureates and three more who shared in the 2007 Nobel Peace Prize through their work on Climate Change. Most recently, Shuji Nakamura (pictured) won a 2014 Noble Prize in physics for an innovation that led to the creation of the white LED lightbulb, which has globally reduced carbon emissions by millions of tons (more). UCSB is home to a startling range of innovative research and courses. Consequently, U.S. News & World Report ranked UCSB among the top ten public universities in the nation in 2015. Our faculty includes 31 members of the American Academy of Arts and Sciences and 29 members of the National Academy of Sciences (more). It has been called the “greenest” laboratory facility in the United States. Bren Hall, home of the Environmental Studies Program and the Bren School of Environmental Science & Management, was both the first building in the nation to receive a LEED (Leadership in Energy & Environmental Design) rating of “Platinum” by the Green Building Council, as well as the first to receive a second Platinum LEED award for its operations and maintenance (more). Our editors scour the web in search of news & stories. Visit Environmental Humanities or Climate Futures.